If you recall, the first week we took an airplane ride over Chordland just to get the lay of the land -- the overview of the world of chords. 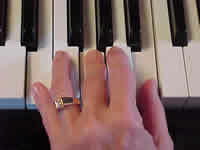 Then in last weeks lesson we showed you how easy it is to learn ALL the major chords (there are 12 of them) and be able to play them in seconds -- not hours or days or weeks or months or years. 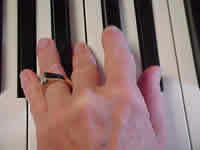 Some people go through their entire lives not being sure about what such and such a major chord is -- and it's all so unnecessary, because you can memorize them in just a few minutes, and learn to play them in 12 seconds or less - one second per chord. 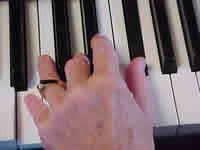 I have had many private students over the years who could play them all in as little as 5 seconds -- one little gal (she was about 12 at the time) had particularly fast hands, and could play them in - believe it or not - 3 seconds! 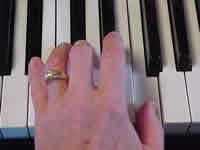 I have slow hands with fat fingers, and yet I can play them in something like 5 or 6 seconds. If you need a review of that lesson on major chords, click here before going on. 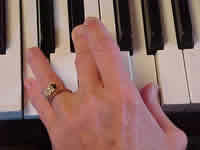 I hope that you noticed that the ONLY DIFFERENCE between major and minor chords is that the 3rd of the chord is lowered 1/2 step -- that's all. 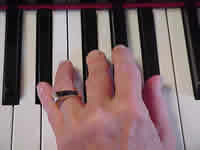 Every major chord is made up of the root, 3rd, and 5th of a major scale, so all you do is lower the 3rd 1/2 step. Like we did with major chords, practice playing the first 3 chords over and over until you can move between them smoothly and quickly. 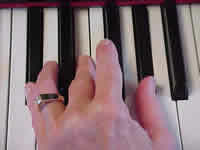 Then practice the next 3 chords -- then the next 3 -- then the last 3. After you can play them by 3's, practice playing the first 6 without stopping. 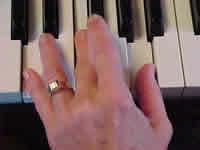 Then practice the first 9 without stopping. 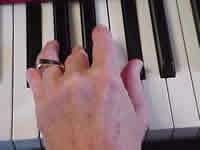 Then finally practice playing all 12 without stopping. 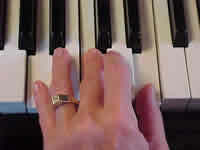 Then play them in major-minor sequence: In other words, C major then C minor; F major then F minor; G major then G minor, and so on through the 12 chords. Now you have 24 chords under your belt -- 12 major and 12 minor. 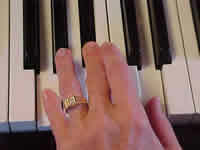 There's no particular virtue, of course, in playing them quickly, except for the fact that it makes you confident you can find them in a hurry when you need them in a song. 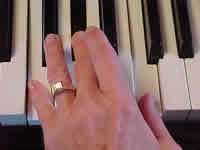 But you'll find that as your confidence grows, your enjoyment and competence in piano playing with grow commensurately. That's it for this week. By next week you ought to be a pro at all the major and minor chords -- every single one. Next week we'll learn how to stand 'em on their heads, and therefore triple the number of chords we can play quickly from 24 to 72!